Magna has already launched production of the 2019 Jaguar I-Pace electric crossover in March at Magna Steyr in Graz, Austria. BEIJING — In China, where the future of the car is looking more and more electric, newcomers to the auto industry are looking for partners to help them build their vehicles. Enter Canadian auto supplier Magna International, which aims to spearhead a shift to contract vehicle manufacturing through its new partnership with state-owned Chinese carmaker BAIC Group. According to five people familiar with the matter, their joint venture is likely to build vehicles for ride-hailing giant Didi Chuxing and possibly Chinese electric car startup Singulato Motors, in addition to BAIC’s electric unit BJEV. The venture has yet to disclose talks with Didi and Singulato. 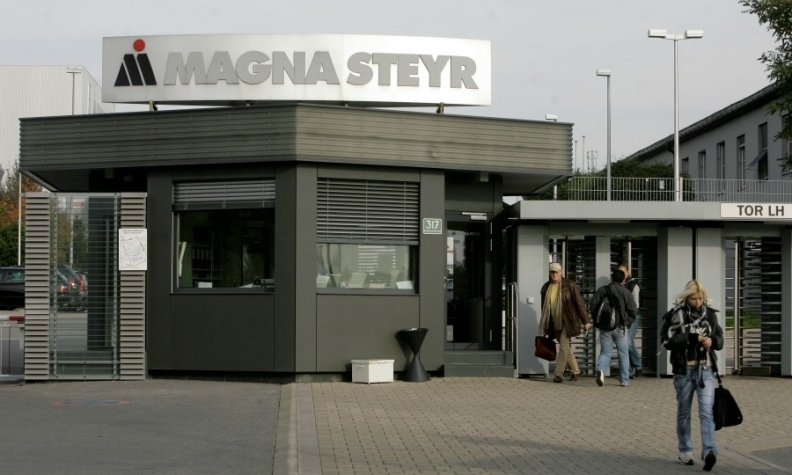 The Magna-BAIC deal, announced in June, realizes a long-held dream of Magna Steyr, the supplier’s Austrian unit and the world’s biggest player in the still niche business of contract car assembly, to expand beyond Europe. It could also portend the rise of an ‘automotive Foxconn’ for electric cars — an idea discussed by industry executives for years. Given EVs’ low volumes compared to traditional models, it makes sense for some firms to outsource assembly in the same way Apple and other tech companies do with Taiwan’s Foxconn, formally known as Hon Hai Precision Industry Co. Ltd. The time is ripe for such a development in China, some experts say. Beijing’s use of industry quotas and other policies to make the world’s biggest auto market as electric as possible has given rise to at least 50 Chinese EV startups, many of which will need a helping hand. Magna is well placed to take on the challenge, already producing cars for Mercedes-Benz, BMW and Jaguar in Europe, including the all-electric Jaguar I-Pace SUV. The venture with BAIC will co-opt a BAIC plant in Zhenjiang in the eastern province of Jiangsu which has an annual production capacity of 180,000 vehicles. “This is exactly what some people think companies like Tesla should have done — let experienced companies like Magna do the manufacturing for them,” said James Chao, Shanghai-based chief analyst at consultancy IHS Markit. Magna officials say the China joint venture’s primary objective is to help develop vehicle technologies for BJEV. It is also expected to produce cars for BJEV’s Arcfox brand that aims to compete with Tesla, according to BAIC. But it could offer the same services to external companies or make “already developed products” with different platforms from the one the joint venture would help develop for BJEV, said Klaus Drobnak, head of Magna Steyr’s Asia operations. Asked how quickly and big contract manufacturing would grow in China, Drobnak, who is based at Magna Steyr’s headquarters in Graz, Austria, said he wasn’t sure at this early stage. “But we are trying to spearhead such a development,” he said. Didi will most likely be one of Magna’s first clients in China given its deal with BAIC this year to work together on customized vehicle design, according to three of the people. All sources declined to identified as they were not authorised to speak to media on the matter. The firm, which dominates China’s ride-hailing market and which sources have said was valued at $56 billion in 2017, wants its own fleet, tailored for ride-hailing and car-sharing. The cars are set to emphasize passenger comfort but may not have features such as the high performance engines found in mainstream models as they will not need to go that fast. Its plans come amid increased restrictions on car ownership in cities such as Beijing and Guangzhou to ease congestion and combat pollution - changes expected to spur more use of ride-hailing and car-sharing, said Yale Zhang, head of Shanghai-based consultancy Automotive Foresight. Didi’s first-generation car, dubbed the D1 internally, is slated to be deployed by 2020, people familiar with the plans said. Its D2 and D3 models are also being worked on, although they are still in the early planning stages. Didi declined to comment on specific plans, saying only that BAIC was a valued partner. For both companies, partnering makes sense as they seek to manage the very expensive costs involved in electric car technologies. “We pay half and half for r&d and manufacturing costs and we would share revenues. We save a ton of money,” said one of the people. Singulato, backed by domestic investors and Intel Corp., which has a small stake, also has a pre-existing partnership with BAIC. That deal includes the development of ‘intelligent vehicles’ and sharing manufacturing resources. It needs a contract manufacturer’s help rather urgently because it has not yet received a car assembly license from regulators, even though it plans to begin producing and selling its first model, an SUV called the iS6, by the end of this year. Two sources said the Magna-BAIC plant, which needs to be modified and re-tooled in line with Magna’s production system, may not be able to help Singulato immediately. In that case, the iS6 would likely be first made by BAIC with the joint venture possibly taking over later, they said. “Even if Magna in the end were not able to help Singulato initially, it’s great for BAIC to have access to Magna’s engineering, manufacturing and quality-control know-how,” said one of the people.